Discount available! 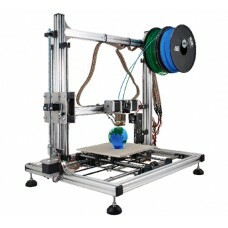 Recommend 3DRAG - 3D Printer dual extruder - KIT to your friends and get your Discount. 3D printer with dual extruders, heated plate, capable of printing of objects of maximum size 170 x 200 x 200 mm using ABS or PLA 1.75 mm filaments. Extremely fast and precise even at high speed. Compatible with all the software and the RepRap Firmware available for free, allows you to create plastic objects of any shape. Made by aluminum profiles designed to lock-in mounting. Designed and engineered to give lightness and rigidity for vibration suppression and unwanted resonances. The printer uses the X/Y system to move the plate and Z to move the extruders. This particular configuration allows to simplify the extrusion system that is simply attached to the structure that moves on the axis Z. The measures have been studied to make the printer compact and a low center of gravity, aligned with the two belts. The support for the printing plate is designed to accommodate a plate heated from epoxy glass that promotes a good adhesion of the print material (PLA / ABS) reducing the risk of detachment of the objects. To control the 3Drag 3D printer you need a computer (Mac, Win and Linux) and an internet connection to follow the manual installation instructions. The package includes all the mechanical parts, small parts, the control board, the engines, the power supply, the heated plate and 5 meters of PLA. 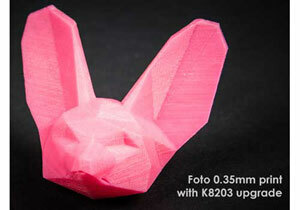 Firmware for dual extruder and alphanumeric display. The proposed version uses the engine driver 1/32 of steps for the two extruders engines. If you want to use the original driver of 3DRAG (1/16 step), you will need to lower the number of steps per mm extruder, passing from 150 to 75. By connecting the USB cable and / or from network adapter, no LED lights up. Verify that the power supply is delivering 15V and that this is properly connected to the 220Vac mains socket and the communication cable is connected to the USB port. Connected the printer and connecting to the PC, while choosing the right COM port, the software does not communicate with the board. Check that you have entered the jumper supplied with the printer, on JPROG connector. Also make sure of the configuration parameters of the serial port within the software, the baud rate is set to "250.000bps" and the Protocol on "Autodetect". By placing the Home of Z axis, when the respective adjustment screw extruder is raised, the axis is positioned at the exact point; if you make the home when the screw closes the switch of the limit switch, the axis Z does not fit properly. 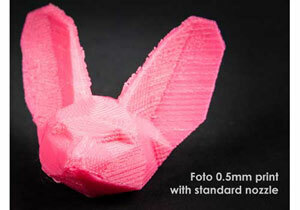 The findings is correct, we recommend that you lift a few millimeters the Z axis before proceeding with the Home. As soon as you connect the printer or during printing shows "Error message: Printer stopped to two errors. Fix the error and use M999 to restart. " Probably due to a bad contact or other reason, the temperature sensor has reached a temperature outside maximum / minimum scale. It is advisable to verify that the card side terminal is good contact on the corresponding plug pin. Verify if necessary, following the wiring of the sensor, that the two wires relating to it, are not shorted at some point. During printing, there is a loss of step sul'asse X and / or Y. In the Slic3r parameters set as "Travel Speed" a value less than 100, you may want to set 80. If this solution is not effective, reducing the Vref on the engine driver to 0.40V and if necessary to cool with a small heatsink or fan the driver. Trying to manually move the axis X and / or Y relative to the Home, the dish is a short drive in the opposite direction. Check that the relevant limit switch is properly connected, or the wires are connected either card side, which switch side, using the two external terminals, thus leaving the center free. During assembly it was placed on the ingranggio motor hub to a correct position, verify that this position has been followed. Improve your 3D printer with this heated plate able to reach a temperature of 90..
Package contains 5 sheets of A4 transparent stickers, ideal for printing with ABS or PLA and to impr.. Equipped with rotary encoder, LCD display and SD card slot card, this card allows you to control the.. Roll of blue tape ideal for printing with ABS and PLA and to improve the adhesion of the printing pl.. The 3D Printer Full Graphic Smart Controller with 3Drag adapter will allow you to use your 3D printe..
1,75 mm Blue PLA on reel for 3D printers - 1 KG. Additional informatio..
1,75 mm Blue PLA on reel for 3D printers - 1 KG.Additional informationPolylactic acid or polylactide.. Flexible natural filament with 3 mm diameter suitable for 3D printers equipped with..
Set specifically adapted to assemble, without problems of equipment, the 3Drag printer. Contains: 1 ..
Made of tempered glass of 3 mm thickness, this pan..
Manual minishredder with frame and blades mad.. Fan with high airflow and low noise. Dimensions 40x40x10 mm, rate..
20 pack of filament (5 meters each) in different colours (total 100m) 1.75mm di..
Package containing 5 sheets of 220x220 mm blue adhesive tape. Ideal for those who p..
3DRAG - 3D Printer dual extruder - KIT is available under Free Filament For You. Click here to know more.